Tektōn is an ongoing collaborative project between Mike Faulkner from D-Fuse and Paul Mumford of Labmeta	exploring the spatio-temporal qualities of light and motion. Digital/machinic instruments are imagined through software and driven by animation algorithms to engineer different formations of kinetic light. As the machine itself is rendered invisible we witness the traces of structure and spatial presence the light leaves behind. Inspired by the form-finding techniques of architects such as Konrad Wachsmann and the constructivist designs of Vladimir Tatlin, and László Moholy-Nagy, mechanical rules are used as creative constraints in a virtual system of light. Each set of constraints give way to the production of a different tool, resulting in emergent behaviours and forms, where traces of light dynamically organise themselves in the tension between simplicity and complexity. 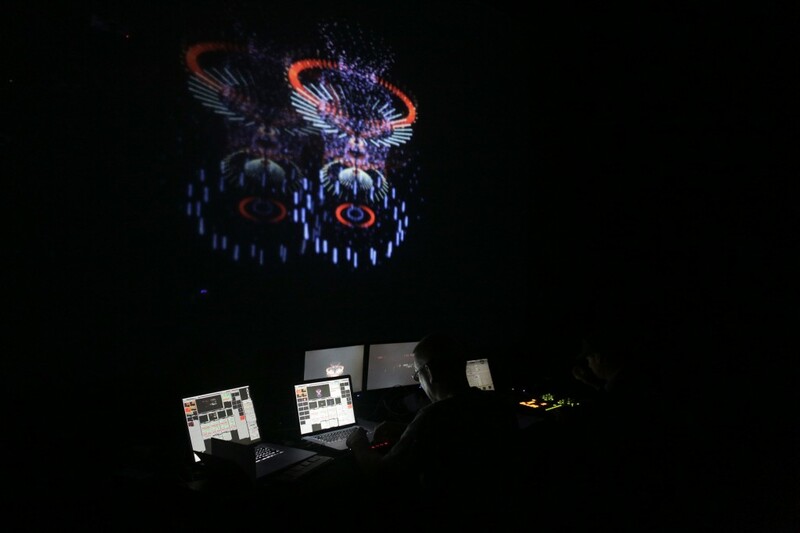 Beginning as a series of audiovisual films that explored animation techniques focusing on rotational vectors and cylindrical patterns with a range of artists including Hauschka, L’Usine, Heaven 17 and Swayzak, the work has since been developed into a live audio-visual performance with music by Matthias Kispert [D-Fuse]. The live audio-visual performances are presented on 3 layers of screens: 2 transparent gauzes hang in front of the performers with a solid projection screen at the back, allowing images to float, diffuse and spatialised.